“I am leaving the Senate, but I am not leaving our State.” That was John Kerry’s promise tonight during his last speech as the senior Senator from Massachusetts. Tomorrow he will be sworn in as the new Secretary of State, following the resignation of Hillary Rodham Clinton. 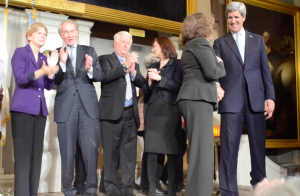 Kerry chose Boston’s Faneuil Hall as the place to give his farewell speech. It is the same place where 8 years ago he announced his run for the Presidency. Now Kerry will take a position in a tough international time when the U.S. is facing the possibility of a military crisis in Syria, and Iran continuing to develop nuclear power. Kerry’s first destination as the Secretary of State is unknown, but experts say he is determined to work hard to keep up with what Hillary Clinton has achieved in this position.